First, let me get a genuine compliment out of the way. 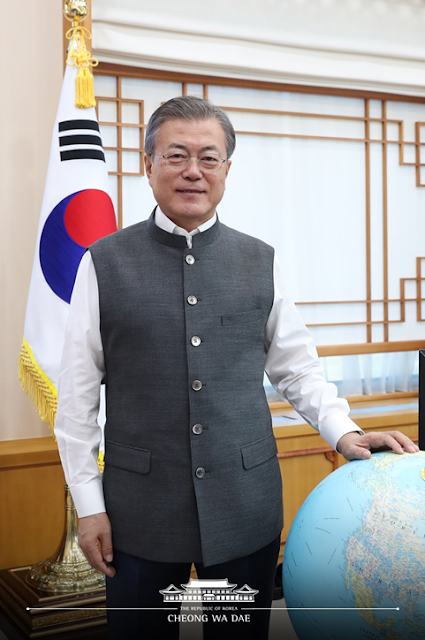 President Moon Jae-in looks dapper in the traditional Indian vest tailored perfectly by Jade Blue of Ahmedabad. This is very becoming and one has no dispute there. He can wear as many as he wants, as many times in as many colors as and when he pleases. 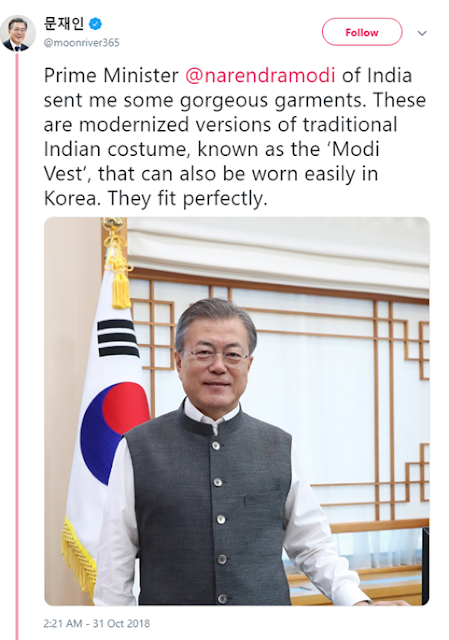 Now on to an utterly silly discussion about whether it is okay for President Moon to describe the vest as “Modi Vest” as he did in his tweet thanking the Indian prime minister yesterday for gifting him a bunch of them. I have done some serious research into this risible debate that no one is having other than me. I checked his Twitter feed and found a picture of four vests neatly hanging on hangers. That is what solved the mystery. 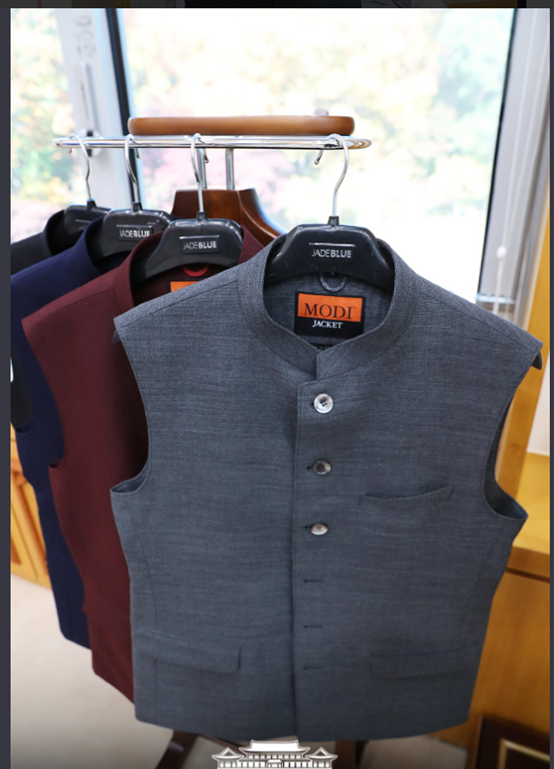 They are indeed named “Modi Vest” by Jade Blue. So the South Korean president is accurate in describing them as “Modi Vest.” It is not his fault. However, I still take issue because I have nothing better to do this morning. The vest has been an Indian attire for a very long time, long before Modi managed to lend his weird celebrity to it prompting a smart clothing line business in my hometown to brand it after him. I am told his own vests do indeed come from Jade Blue. They are sharply tailored and do in a sense update the traditional Indian vest that used to be and still is made from somewhat floppy cotton and nowhere near so well-stitched. Nevertheless, the vest is not a Modi invention. Contrary to popular perceptions, it is not an invention of India’s first Prime Minister Jawaharlal Nehru, who wore it equally famously, either. I would like to think that for a leader in the midst of the tumult and ferment of India’s freedom campaign he would not have the time to design clothes. The vest was worn by a host of other contemporaries of Nehru’s including the great Sardar Vallabhbhai Patel, whose world record-breaking statute Modi inaugurated yesterday. I have zero problem with Modi managing to lend it some fashion finesse with the obliging help from Jade Blue. The prime minister does wear it well. And we know that President Moon too wears it equally well. It is the sort of attire that most people would wear well, especially if it is tailored as sharply as this particular range is. That said, (I dislike this expression because it is used as a sort of mitigating device), the vest is as much the “Modi Vest” as it was the “Nehru jacket” before that or the topi, the boat-shaped Indian cap, was the “Gandhi-topi”. In other words, not at at all. Millions wore that topi before Gandhi ever did. Unfortunately, it is a fact that things often need some iconic users—even if not explicit endorsers—to become famous and then they become irretrievably identified with them. For now the vest has become identified with Modi. Do I find it so exceptionable as to feel exercised over it? Not really. Like I said it is a laughable subject. But in the larger context of leaders usurping legacies which are not theirs it is instructive that a mere vest has become such a grand fashion statement and signifier of a particular leader even though he can claim no credit for it other than wearing it. It strikes me that if the 2019 general election does not go the prime minister’s way, haberdashery could be an attractive career move.